The CROMELLINS, though established in France and possessed of considerable property at Armancourt, Picardy, for more than a century before the revocation of the edict of Nantes, came originally from the Low Countries. "Ce marriage fut célèbre à Folembray Château Royal entre Chauny et Coucy, le 17 Déc. 1595, honoré de la présence de Madame Catherine de France sœur du roi HENRY IV, qui y tenoit sa cœur". Two of Jean de Camas's grandsons, named Jacques and Adrien, received patents of letters of nobility from LOUIS XIV; and others became Seigneurs de Mézières, Senancourt, Armancourt, and De Bersy. A granddaughter of the latter married the Comte de Stolberg in Prussia in 1733. LOUIS CROMMELIN, born at Saint-Quentin, 1625, espoused, in 1648, Marie Mettayer, and had issue, eight children. 1. LOUIS (1653-1727), who established the linen trade in Ulster. In 1698, Louis, with two brothers and three sisters, and several cousins and members of his family, "was induced" by WILLIAM III to go over to Ulster, where they settled at Lisburn, County Antrim, bringing with them a number of tradesmen and a capital of £20,000 (in excess of £4 million today) with which they established the linen manufacture, which was adopted by the inhabitants, and flourished thereafter. In consideration of Louis having spent £10,000 on its establishment, His Majesty, who was greatly interested in its success, conferred a pension of £200 a year on his son, on whose early death it was discontinued. Mr Crommelin wedded, in 1680, his cousin Anne, daughter of Samuel Crommelin; left France in 1685, and settling first at Amsterdam, came to Lisburn in 1698. He had issue, one son and a daughter: Louis, died at Lisburn, 1711, unm, aged 28; and Magdaleine. 2. Samuel, twice married and left four sons, of whom all male issue became extinct. 3. William, wedded Miss Butler, of the Ormonde family, and had a son, Louis, who died unmarried, and a daughter. 4. Jeane, married Abraham Gillot. 5. Anne, espoused firstly, Isaac Cousin de Meaux; and secondly, Daniel de la Cherois, by whom she had an only daughter, Marie Angélique Madeleine (who died at Donaghadee, 1771), who wedded Thomas, 5th and last Earl of Mount Alexander, by whom, having no children, she was left all his property, and on her death she left it to be divided between her cousins, Samuel de la Cherois and Nicholas Crommelin. 6. MARIE, of whom we treat. Madeleine, m her cousin, Daniel Crommelin. SAMUEL DE LA CHEROIS (1744-1816), assumed, in compliance of the will of his cousin, Nicholas Crommelin, of Lisburn, the additional surname of CROMMELIN. Mary; Sarah; Anne; Harriet Judith; Jane Suzanna. Anna Sarah; Maria Matilda; Clara Suzanne; Elizabeth Emily. EVELYN ANGÉLIQUE, of Carrowdore Castle. FREDERICK ARMAND DE LA CHEROIS-CROMMELIN JP (1861-1902), of Carrowdore Castle, who espoused, in 1891, Nina, youngest daughter of the Rev Calvert Jones, of Heathfield, Swansea, though dsp 1902. MARIA HENRIETTA and EVELYN ANGÉLIQUE DE LA CHEROIS-CROMMELIN, of Carrowdore Castle (jointly with their sister, Mrs Shaw). CARROWDORE CASTLE, near Donaghadee, County Down, was built in 1818-20 by Nicholas de La Cherois-Crommelin. This three-storey rubble and brick Georgian-Gothic house was built in a rustic gothic style, with castellations, corner turrets and large projecting tower. The interior is still largely intact, though some rooms to the rear of the house have been altered in recent times and a large, modern, glazed sun-room has also been added. The three-storey tower to the south has a Jacobean-Gothic feel and appears to be intact; whilst the similar (but much smaller) three-storey gazebo to the east of the house is now in a ruinous condition. There is some very graceful Gothic plasterwork fretting on the hall ceiling. Prior to 1818 there had been a farmhouse on the site which Nicholas de la Cherois's father had used only occasionally, usually as a place to collect rents from his tenants and as a summer residence. 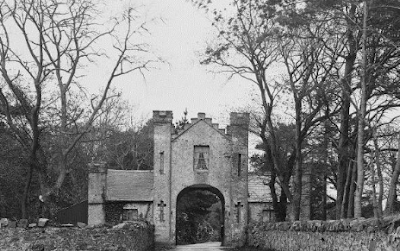 After its completion in 1820, Carrowdore Castle served as Nicholas’s primary residence until 1847, when pressing financial concerns forced him to live at Cushendun, County Antrim, and rent the house to his son Samuel. The de la Cherois-Crommelin male line came to an end with the death of Samuel’s son, Frederick, in 1902. The contents of the house were sold the same year and the building itself was leased to a number of tenants before being sold to a Mr McNeill in 1931. 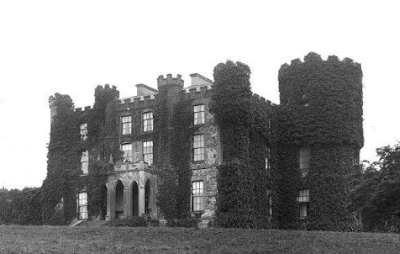 The present owners acquired Carrowdore Castle in 1972 and renovated some of the rooms to the rear, as well as adding the large sun room extension. About 1992, a new dwelling was constructed a short distance to the south-west. Since that time Carrowdore Castle has remained largely vacant, save for two ground floor rooms to the south-east which are currently leased to Strangford College. The outbuildings to the south have been renovated recently and now appear to be used as holiday homes. Parkland surrounds the house and small blocks of woodland, with a shelter belt beyond. There is a well planted and manicured ornamental garden to the east of the house, which slopes to a lake. A stone gazebo terminates the castle battlements. The layout of the parkland has changed remarkably little from the early 19th century, except for the presence of a modern mansion built south-west of the old house. The main entrance gate lodge, a surviving one of two gate lodges, is contemporary with the old house and is notable for a castellated parapet and towers, with a pair of dwellings, which have now been largely demolished. Carrowdore Castle is the home of Dr Francis Jennings DSc, brother of Shamus Jennings CBE.